Camper & Nicholsons Palma broker Arne Ploch announces the recent delivery of the new 45.24 metre displacement motor yacht Follow Me V, built by Spain’s Factoria Naval Marín. From concept to launch, the project was put together by Arne Ploch for a repeat client, from choice of designer and shipyard to interior layout, features and design, resulting in a high quality displacement yacht of stunning sleek lines, steel hull, aluminium superstructure and a modern classic interior, all performed under strict supervision. 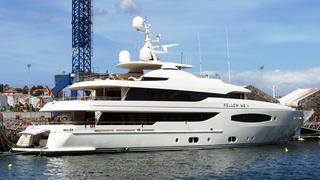 Follow Me V was built to Lloyds class and, MCA compliant, accommodates 12 guests in six staterooms. The exterior styling is by Reymond Langton while the interior is by Design Studio Spadolini.